•All the following ages must be calculated starting from the year of birth. Therefore the athlete’s age is the one he is going to have at the end of the current year. The minimum required times shown above are to be considered starting from the day the athlete is registered at the IBJJF in each belt. First Paragraph - White, grey, yellow, orange, green, blue, purple and brown belts have 5 levels each: clear belt plus 4 degrees/stripes. It is up to each instructor to award the stripes in each of these belts. 2. In order to request the black belt certificate it is necessary to be currently affiliated to the IBJJF, have gone through a first aid course and be approved in the referee course over the previous 12 months. 3. You may request your 1st degree after 3 years as a black belt. In order to do so it is required that you have renewed your IBJJF membership card every year during the period, have gone through a first aid course and be approved in the referee course over the previous 12 months. 4. You may request your 2nd or 3rd degrees 3 years after being awarded the previous degree. It is required that you have renewed your IBJJF membership card every year during the period, have gone through a first aid course and be approved in the referee course over the previous 12 months. - renew your IBJJF membership card every year during the 5-year period. - be approved in the IBJJF official referee course over the previous 12 months. - be listed as the main instructor or assistant instructor in a school that has renewed its membership to the IBJJF over the previous 5 years OR provide the degree form signed by a certified black belt no lower than 2nd degree who is the main instructor in a school that has renewed its membership to the IBJJF over the previous 5 years. - renew your IBJJF membership card every year during the 7-year period. - be listed as the main instructor or assistant instructor in a school that has renewed its membership to the IBJJF over the previous 7 years OR provide the degree form signed by a certified black belt no lower than 2nd degree who is the main instructor in a school that has renewed its membership to the IBJJF over the previous 7 years. - renew your IBJJF membership card every year during the 10-year period. - be listed as the main instructor or assistant instructor in a school that has renewed its membership to the IBJJF over the previous 10 years OR provide the degree form signed by a certified black belt no lower than 2nd degree who is the main instructor in a school that has renewed its membership to the IBJJF over the previous 10 years. 9. In case you do not renew your IBJJF membership card and/or your school’s membership to the IBJJF in a specific year, that year will not count in the minimum time required to obtain a new degree. 10. The 10th degree red belt is limited to the pioneers of Brazilian Jiu-Jitsu: Carlos, Oswaldo, George, Gastão and Hélio Gracie, also known as the Gracie Brothers. The remaining belts (blue, purple, brown, black, and above) are awarded only to adults, with various age and time-in-grade restrictions for each. While this is certainly the most prevalent system it is not exclusive, a prominent exception is the system used by American Top Team, which awards green belts to adults as a rank between the IBJJF white and blue belts. In 1907, Kanō Jigorō, the founder of Judo and the individual who would later dispatch Mitsuyo Maeda on the trip to Brazil that resulted in the development of BJJ, introduced the first use of belts (obi) and gi (judogi) within the art of Judo, replacing the practice of training in formal kimonos. At the time however, Kanō implemented only the use of white and black belts, with white representing the beginner, as a color of purity and simplicity, and black being the opposite, representing one who is filled up with knowledge. Mikonosuke Kawaishi is believed by many to have been the first to introduce additional colored belts. 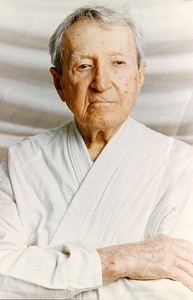 He originated this practice in 1935 when he began teaching Judo in Paris, France. Kawaishi felt that structured system of colored belts would provide the western student with visible rewards to show progress, increasing motivation and retention. Kawaishi's adoption of colored belts came only 10 years after Carlos Gracie opened his academy in Brazil. Since then, Brazilian Jiu-Jitsu, Judo, and many other martial arts have adopted the use of colored belts as a way to denote a students increasing progress. Purple belt is the intermediate adult ranking within the art of Brazilian Jiu-Jitsu, coming after the rank of blue belt and before brown belt. It is often considered one of the longer held ranks, and typically takes at least 4-5 years of dedicated training to achieve. Even as an “intermediate” rank, the purple belt level practitioner holds a formidable amount of knowledge, and purple belts are generally considered qualified to instruct lower belts in other arts students with a similar amount of time and effort invested would often be ranked as a black (instructor) level belt. Aside from the exceptional belts awarded at the highest levels, brown belt is the highest “color” belt rank within the art of Brazilian Jiu-Jitsu, providing a transition between the intermediate purple belt rank and the elite black belt. Brown belt is arguably the beginning of the elite ranks in and of itself, typically taking at least 5-6 years of dedicated training to achieve. As a transitional rank, it is often thought of as a time for refining rather then accumulation, where a practitioner hones already acquired technical and practical skills until they reach a black belt level. When a Brazilian Jiu-Jitsu black belt reaches the 7th and 8th degree, the practitioner is awarded an alternating red-and-black belt (Similar to the alternating red and white belt earned at the 6th degree in Judo). Black-and-red belt holders are very experienced practitioners, most of whom have made a large impact on the overall art of Brazilian Jiu-Jitsu. Some notable current black-and-red belt holders are Carlos Gracie Jr. and Pedro Sauer. It is awarded in lieu of a 9th and 10th degree black belt (identical to the art of Judo). Assuming that someone received his or her black belt at 19 years old (the minimum age to receive a black belt under the IBJJF's graduation system) the earliest they could expect to receive a 9th degree red belt would be at the age of 67. The 10th degree Red Belt is permanently reserved to the founders of Brazilian Jiu-Jitsu: Carlos, Oswaldo, George, Gastão and Hélio Gracie. ■Performance in grappling within the academy and/or competition. Technical and conceptual knowledge is judged by the number of techniques a student can perform, and the level of skill with which they are performed in live grappling. This allows for smaller and older practitioners to be recognized for their knowledge though they may not be the strongest fighters in the school. Brazilian Jiu-Jitsu is a distinctly individual sport, and practitioners are encouraged to adapt the techniques to make them work for their body type, strategic preferences, and level of athleticism. The ultimate criterion for promotion is the ability to execute the techniques successfully, rather than strict stylistic compliance. As noted above, the art of Brazilian Jiu-Jitsu historically has had an informal approach to belt promotions, with one or more instructors subjectively agreeing that a given student is ready for the next rank. In recent years however, some academies have moved toward a more systematic, formalized testing approach. This is especially true for the lower ranks, where the decision to promote is arguably the least contentious. One of the first instructors to publicly publish some of this formalized testing criterion was Roy Harris, who has formalized promotion tests, up to and including black belt. Formalized tests are generally based around the same elements as a normal promotion, that is, technical/conceptual knowledge and the ability to apply those techniques against a resisting opponent. Some tests however, take other aspects into account, such as a student's personal character or a basic knowledge regarding the history of the art. Formalized testing may also contain conditions more familiar to traditional martial arts, such as testing fees and a required amount of pre-testing private lessons with the instructor. Students are generally encouraged to compete, as it can play an important and often times accelerating role in a practitioner's growth and overall speed of promotion. Competition allows an instructor to gauge a student's abilities while grappling with a fully resisting opponent, and it is not uncommon for a promotion to follow shortly after a good competition performance. In most academies it is not an essential prerequisite for promotion, but there are exceptions to this and in a minority of schools, competing is not only endorsed but required. Stripes can be as formal as small pieces of cloth sown onto the sleeve of the belt, or as informal as pieces of electrical tape applied to the same general area. Although the exact application (such as the amount of stripes allowed for each belt) varies from school to school, the IBJJF sets out a general system where 4 stripes can be added before the student should be considered for promotion to the next belt. Stripes are only used for ranks prior to black belt, after black belt is achieved, the markings are known as "degrees" and are only formally awarded (with time-in-grade being as significant a factor as skill level). Unlike the belt system, stripes are not used in every academy and, where they are used, they may not always be applied consistently. ■The newly-promoted student thrown by his instructors, and sometimes also by each of the students with equal or higher grade in the academy. In recent years some have criticized the practice, citing philosophical and even legal reasons, and it is no longer part of some prominent academies. Advocates for the custom argue that "running the gauntlet" serves as a method of team building and reinforces camaraderie between classmates.